Physical characteristics: The highland tinamou is 15 inches (38.5 centimeters) long and weighs 2 pounds (0.9 kilograms). Its coloring is mottled (spotted) or barred with black and cinnamon on its back and wings. Its throat is usually rust-colored. Geographic range: Highland tinamous live in Colombia, Costa Rica, Ecuador, Panama, Peru, and Venezuela. 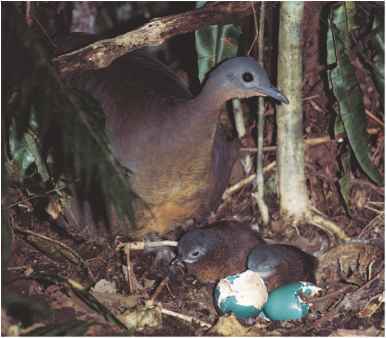 Habitat: This tinamou lives in tropical and subtropical rainforests, usually above 5,000 feet (1,500 meters). The highland tinamou prefers wet areas, especially ones with bamboo thickets. 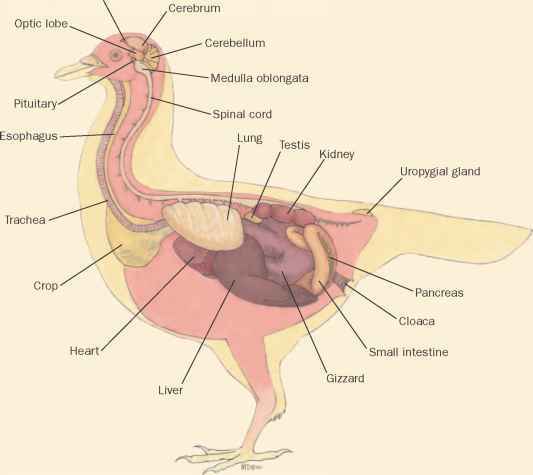 Diet: The highland tinamou eats mainly fruits and small animals and reptiles, such as lizards, frogs, and mice. Behavior and reproduction: The male highland tinamou makes a rough and hollow-sounding crowing or barking call that can be heard for several miles (several kilometers). He makes the sound repeatedly while in his home territory. The male defends his territory and attracts a harem of three females with his calls. He builds a nest in dense vegetation where the females each lay three eggs. The male sits on the nine eggs until they hatch. He usually leaves the nest no more than once a day to look for food. Highland tinamous and people: The highland tinamou is hunted by humans for its meat. As a result, populations are declining in Peru and Costa Rica. Davies, S. J. J. F., et al. Bird Families of the World. Vol. 8, Ratites and Tinamous: Tinamidae, Rheidae, Dromaiidae, Casuariidae, Apterygidae, Struthionidae Oxford, U.K.: Oxford University Press, 2002. De la Pena, Martin R., and Maurice Rumboll. Birds of Southern South America and Antarctica. Princeton, NJ: Princeton University Press, 1998. Feduccia, A. The Origin and Evolution of Birds, 2nd ed. New Haven, CT: Yale University Press, 1999. Perrins, Christopher M., and Alex L. A. Middleton, eds. The Encyclopedia of Birds. New York: Checkmark Books, 1985. Howard, Laura. "Tinamiformes." Animal Diversity Web. http://animal-diversity.ummz.umich.edu/site/accounts/information/Tinamiformes. html (accessed May 3, 2004).